Less than ten citations of contemporary secondary sources. Roughly a dozen extra-biblical ancient source citations. Hundreds and hundreds and hundreds of scripture citations. 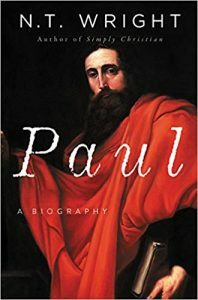 All of that to say Wright’s book, “Paul: A biography” is scholarly but not written in direct conversation with various theories of what is going on with Paul and his letters. This book is very much interested in Paul’s life and theology as a first century Jewish man and Christian missionary in his own historical and scriptural (Old Testament) context. So the book has no footnotes, only end notes and almost all of those are scripture references. What sets this book apart from the rest of Wright’s work on Paul is that he isn’t engaging theological arguments and various points of view. Instead, he maps out a coherent picture of Paul’s life by weaving together the material in Acts and Paul’s letters to help us understand Paul, his mission, and his theology embedded in his own cultural, religious, and political environment. You can pick up on many theological points that Wright argues for in some of his other works throughout the book only as far as it helps Wright paint a picture of the life of Paul. The book works through things chronologically. So you will get to walk through Paul in Acts and see how his letters fit into his journeys. He even gives his timeline of events and letter writing in the back of the book. Wright does far more than pinpoint when certain letters were written in the larger context of his mission and ministry. Wright deals with why Paul wrote what he wrote to the various churches in light of where he was on his journey when he wrote his letters. This is a brilliant integration of the content of the epistles and Acts. There is some level of speculation and guesswork when it comes to these things, and Wright acknowledges that periodically, and I think overall he did an excellent job of piecing this together for us in a coherent and sensible fashion. The book is a bit repetitive in places, as Wright can often be, and I felt this one was more so than usual especially in regard to his work on Paul’s zeal and his Jewish background (Phineas in Numbers and Elijah in 1 Kings 19 as well as the Maccabees) and how that tied into Paul’s work and the Jewish reaction to their perception that Paul was undermining the Law and how that might bring them trouble as it had in the past. He references that on nearly a dozen occasions. The effect of his repetition, though, is the impact it has on our memory and that can be a helpful thing. I would have chosen to repeat a few other pieces than that one. His writing on Paul’s interactions with Jews and Gentiles in his mission and in Judea is extremely helpful. He unpacks Paul’s great difficulty of facing persecution from both sides and the struggles both sides had understanding Paul. On the flip side in his last chapter, the best chapter in the book, he also talks about the appeal of Christianity to pagans that I found very insightful. The last point worth mentioning on the value of this book is his integration of some of his previous material into the life of Paul. This would include things like Wright’s understanding of Torah and Temple as well as the New heaves and New earth theology, the meaning of atonement and justification, the broader Jewish narrative in the New Testament, and whether or not Jews were converted or if Christianity was a fulfillment and extension of their Judaism. All in all the book is excellent and stands shoulder to shoulder with many other excellent books on Paul that have preceded it. I apologize for only putting quotes on the weaknesses of the book. I underlined this book relentlessly because the content was so good. Was Paul the Best, Worst Communicator or is Something Else Going on?